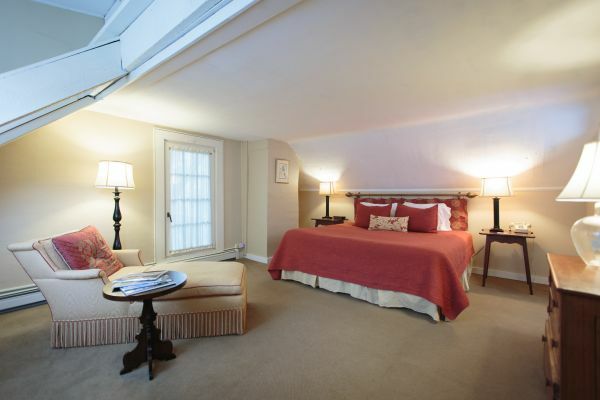 A suite under the eaves on the third floor of the Main Inn. Spacious and bright, it is large enough for a family. 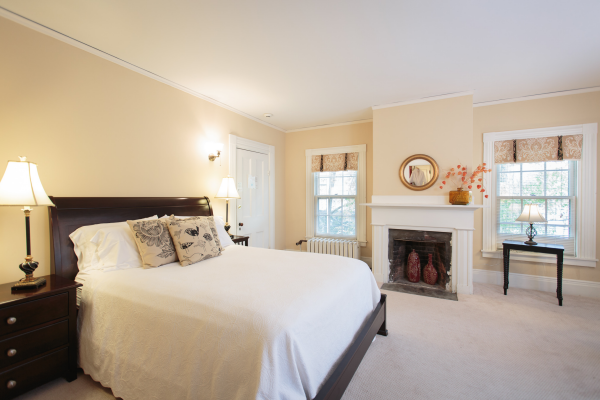 It has a king bed and an adjoining sitting room with two reading chairs and a twin bed. Can easily accommodate an additional rollaway cot or air mattress. The only room in the Main Inn that has a television. This room has a private bathroom with a shower. A third floor suite under the eaves in the main inn. There is a king size bed. The suite has a private bath with shower. This family suite has two rooms and a bath. The first room has a queen and the second room has two twins. Perfect for a family, and newly furnished. The lovely Garden Cottage sits just behind the Main Inn and has a kitchenette, a sleeping loft with queen bed, living room with queen pull-out sofa, television and DVD/VCR, and full bath with tub/shower. The Cottage is pet friendly and is perfect for families and/or extended stays. Rate includes daily housekeeping and breakfast. Weekly rates available.